Natalie has proven to be an excellent graphic equalizer doing its job with outstanding accuracy. 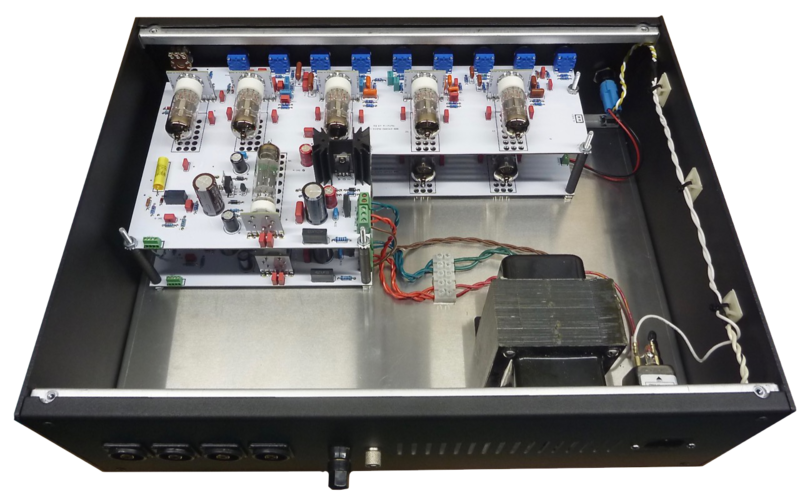 It uses one half of a 12AX7 triode for each frequency and the 5693 for the preamp section. As with all our gear, the power supplies are regulated DC. For B+, we actually use a 6X4 rectifier tube followed by a regulated B+ circuit based around the LR8 high voltage regulator. This ensures a rock steady and ultra low noise B+ supply. Power is provided by our own designed power transformer custom made for us by Heyboer Transformers. Only high quality components are used in the construction of Natalie. Low-noise +/-1% variation metal film resistors are used throughout the signal circuit. Film capacitors or no more than +/- 5% variation and for the all important power supply Nichicon electrolytic capacitors are used. The printed circuit boards are designed in house , manufactured to FR4-TG standards, and are double-layer with full ground planes on both sides to ensure complete screening of the circuits. Tubes are factory new 12AX7, NOS 5693 and NOS 6X4. Each octave is adjustable bewteen -14dB and +14dB cut and boost.